Bang Tango guitarist, EMP Label Group executive and film creator Drew Fortier has elected to release and extended and “definitive” version of his autobiograph Dark, Depressing, and Hilarious: My Bittersweet Journey In and Out of the Music Business. 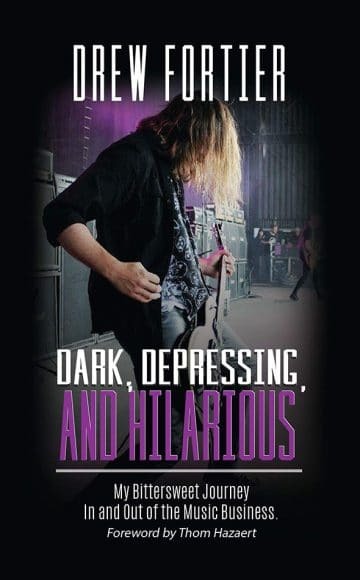 “By popular demand, musician, filmmaker, actor, and now author Drew Fortier has released an extended and definitive version of his autobiography “Dark, Depressing, and Hilarious: My Bittersweet Journey In and Out of the Music Business“. This final version of the book, available in paperback as well as hardcover (for the first time), has more than double the content of its initial release including: more tales from the road, a photo section, and an additional foreword by Fortier‘s high school friend and Attack of Life: The Bang Tango Movie producer Joe Placzkowski. The book is an over-all more in-depth reading experience about Fortier‘s unique and multi-faceted career in the entertainment industry leading up why he decided to eventually and abruptly walk away from it all. From cluelessly making a brutally honest and poignant documentary film on the formerly popular rock band Bang Tango, to joining said rock band as a guitarist; musician, filmmaker, actor, and now author Drew Fortier shares tales from his highly irregular and under the radar career in the entertainment industry which also includes: forming the eclectic pseudo all-star band Zen From Mars, starring in the horror film Her Name Was Christa, playing guitar for and eventually making a film about the late Faith No More frontman Chuck Mosley, and becoming a traveling record label executive with Thom Hazaert for Megadeth bassist David Ellefson‘s EMP Label Group….